"State university" redirects here. For other state universities, see State university (disambiguation). For national universities, see National university. For other related uses, see State college. State university systems were a product of the demand for higher education in the newly formed United States. The tradition of publicly funded state colleges began primarily in the southern states, where in the east and northeastern states other private educational institutions were already established. There remains significant debate about which institution or institutions are the oldest public universities in the United States. The University of Georgia is the country's first chartered public university, established on January 27, 1785 by an act of the General Assembly of Georgia. However, the University of Georgia did not hold classes until 16 years later in the fall of 1801. The first collegiate-level classes conducted by a public institution were at another Georgia institution, the Academy of Richmond County, chartered in 1783 with instruction beginning in 1785. While the Academy, later known as Augusta State University and now merged into Augusta University, was founded as a high school, it taught college-level classes from its creation, and its graduates were accepted into four-year colleges as sophomores or juniors, effectively making it a combination of a modern high school and community college. The school eventually dropped high school instruction, but remained a community college until becoming a four-year institution in 1963. The University of North Carolina at Chapel Hill, while chartered four years after Georgia in 1789, was the first state university to hold classes. Classes began at UNC in 1795, and UNC is the only state university to have graduated students in the 18th century. The University of South Carolina was chartered in 1801 and held classes for the first time in 1805. The University of Tennessee was originally chartered as Blount College in 1794, but had a very difficult beginning—graduating only one student—and did not begin receiving the promised state funds until 1807 when it was renamed East Tennessee University. Determining which state university was the "first" is further complicated by the case of New Jersey's state university system. Facing the embarrassment of being the only state left that had not established a state university, the New Jersey Legislature decided to commission an already existing private university as its state university, rather than build one from the ground up, as other states had done. Rutgers University, which had previously been a private school affiliated with the Dutch Reformed Church, was designated as a state university by acts of the legislature in 1945 and 1956. It became a 'System' with the absorptions of Newark University in 1946 and The College of South Jersey in 1950, becoming Rutgers' Newark and Camden campuses, respectively. Rutgers was chartered in 1766, nineteen years before the University of Georgia, but did not become the State University of New Jersey for another 179 years. Castleton University in Vermont is the oldest state university in New England, chartered in 1787. This was soon followed by the charter of The University of Vermont (UVM) in 1791. However, neither institution was a "state university" in the modern sense of the term until many decades later. Castleton began as the Rutland County Grammar School. It did not become a postsecondary institution until the campus became home to the State Normal School in 1867. Although the school became state-supported at that time, its campus remained privately owned until 1912. UVM was chartered as a private institution and did not become a public university until 1865. The first institution in New England to actually operate as a public university is Westfield State University in Massachusetts, which has been public since its founding in 1838. Consideration of public higher education was included in the earliest westward expansion of the US, with the Northwest Ordinance of 1787, which established the Northwest Territory. It stated: "Religion, morality, and knowledge, being necessary to good government and the happiness of mankind, schools and the means of education shall forever be encouraged." Ohio University (1804) was the first state school so established in the territory (and is also the oldest state university that has continuously operated as a public institution), with the other developing states similarly creating public universities to serve the citizens. On a national basis, the state university system was also assisted by the establishment of the Land-grant universities, under the Morrill Land-Grant Colleges Acts of 1862 and 1890. Many state universities were founded in the middle 19th century, in particular supported by the Morrill Land-Grant Colleges Acts of 1862 and 1890. Many state universities—such as UCLA, Arizona State, and SUNY Geneseo—were founded as normal schools. Following the Second World War, many state universities were merged with smaller institutions to achieve economies of scale in administration and also to raise the prestige of the degrees granted by some smaller institutions. A prominent example of this is the State University of New York, which is the largest comprehensive system of universities, colleges, and community colleges in the world. During the 1970s, further mergers took place and the concept of a state system was widely adopted. Some states have more than one state university system. For example, California has the University of California and the California State University as four-year university systems, and the California Community Colleges as its community college system. Texas has six state university systems, plus four independent public universities. 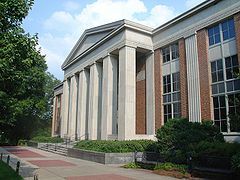 Some states maintain a separate system for state colleges (often specified as community colleges, technical colleges, or junior colleges), distinct from their university system. Examples include the California Community Colleges System, the Florida College System, and the Technical College System of Georgia. In these states, colleges focus primarily on awarding two-year associate's degrees and professional certificates, while universities focus on four-year bachelor's degrees and more advanced degrees. During the growth and restructuring of the state systems, names such as University of California have changed their meanings over time. Berkeley.edu: The Future of Flagship Universities — history of the systems, by Robert M. Berdahl, historian and Chancellor of University of California, Berkeley. History of the University of Texas.